What a Great Day for a Photoshoot..! Insiders Group on Facebook - Join us..! What better way to celebrate the completion of this cold month of March than to have a burst of energy!? 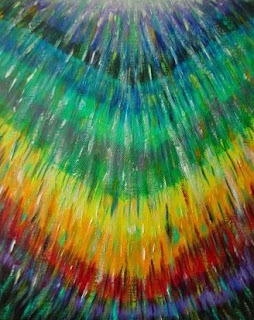 Here is my painting Chakra Shower, (Copyright 2008 by Sheryl Brown, All Rights Reserved) to give you a little of that renewing energy that we all love so well! You may be interested to know that in the process of painting this, I began to think I had overworked it. So I made one of my rare attempts to copy my own work (Trust me, I seem incapable of it!). Thanks for any and all feedback! Maybe it says you’re energetic and complex (like me:D)! This one has pure colors too, underneath the shower!! You too have purity, my dear!